Going 'green' with a high performance hybrid that achieves 7.9L/100kms in the city and 5.9L/100kms on the highway is what this vehicle was all about. It pulled 0-60mph in 6s thanks to its 240hp 3.0L V6 engine and 15hp electric motor (which added a full 100ft-lbs of torque right off idle - which you could really feel) and rode on competition Tien coil-over springs and shocks about 2" lower than stock on a set of 18"x8" BBS rims and 225/45 series Michelin Pilot Sport tires. Lighting was also upgraded to Bi-Zenon low and high beam halo units, and braking was improved with a set of Brembo front slotted and cross-drilled rotors. The stock leather trimmed interior with an impressive stereo and heated, multi-way adjustable seats, left little to be desired as well. An extract from Canadian Driver Magazine - April 2005 . . . 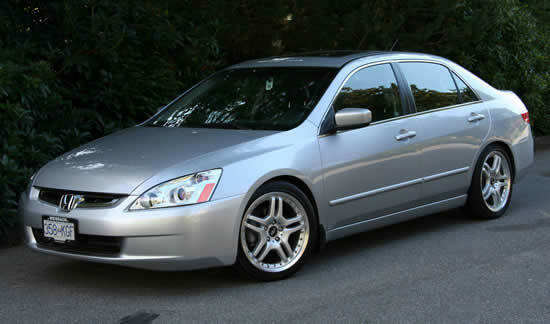 The Accord Hybrid adds Integrated Motor Assist or IMA, Honda's hybrid Technology, to the standard V6. It increases horsepower in the already-powerful car to 255, and raises torque to 232 lb-ft, from 212 in the conventional V6. When accelerating, the multi-talented IMA acts as a motor and supplements the V6, drawing power from a battery located behind the rear seat (the location of which eliminates a folding seat). When the car is decelerating, the IMA functions as a generator and recharges the battery. It is also the starter. Like all hybrids currently on the market, the Accord doesn't require plugging in to recharge the system. The IMA also permits the engine to run on three cylinders when torque is not required (a green light comes on to let you know this mode is operational). This cylinder deactivation technology, which is also used on the redesigned six-cylinder 2005 Honda Odyssey minivan, is designed to further reduce fuel consumption and emissions while running on regular-grade fuel. Furthermore, the engine will shut off at stoplights. Even though the audio, climate controls and lights are operating with power from the IMA battery, you're not using any gasoline at all. All this wizardry is managed by very sophisticated on-board software that allowed engineers to design in unprecedented control over the operation of the drivetrain. But from the driver's seat, it goes largely, but not entirely, unnoticed. The Accord Hybrid achieved 6.2 L/100km in a full day of mostly highway driving. Our speeds ranged from 80-115 km/h, with occasional bursts of rapid acceleration when passing, and some stop-and-go driving in small towns. At the end of the day, and with the "low fuel" warning light on, the car took just under 50L of fuel (regular grade, I should add), which would give the Accord Hybrid, in these conditions, a cruising range of 950 km. We think that with conservative driving, there's 1,000 km available from a tank in the Accord Hybrid - a truly sensational range given its power, size and level of appointment. 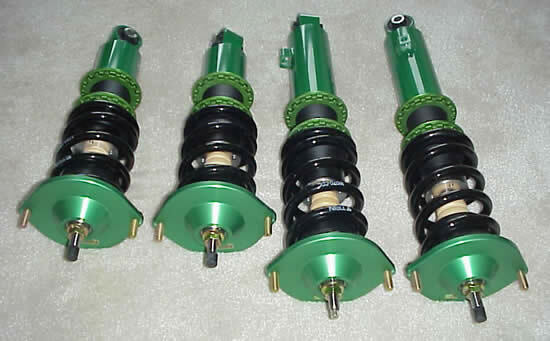 The foundation of the suspension system was the Tein competition coil-overs which includes 4 struts/shocks, and 4 adjustable perch mounted springs. These were beautiful precision Japanese made units with 16 way bound/rebound adjustment capability. After a lot of testing I set them fairly soft at the #4 position - which gave a really firm ride with just the right amount of 'give' over the bumps. At #10 and above, it was brutally stiff. By setting the ride height a full 2" lower than stock, a number of other suspension components had to be replaced - in the front the upper wishbone ball-joint had to be swapped with an adjustable unit that could compensate for camber and caster (when the car was lowered, all of the suspension settings would have been thrown off and there is no adjustment in the stock components); and in the back, 2 of the lower suspension locating arms had to be replaced with adjustable units. The suspension was setup for 1 degree of negative caster up front and back, 0.75 degrees of negative camber up front, and 0.5 degrees of negative camber at back, and 1/8" toe in front and back. It is perfect. I wanted to jam in 18x8" wheels with 225/45 series rubber and it was a super tight fit. I needed to run the full 1 degree of negative camber up front just to keep the tires from rubbing the wheel wells. I also needed to machine 0.120" off the inside of the front and rear wheel hubs, and 0.080" off the face of the Brembo front rotor hub faces as well (and also replace the mounting bolts with lower profile ones). 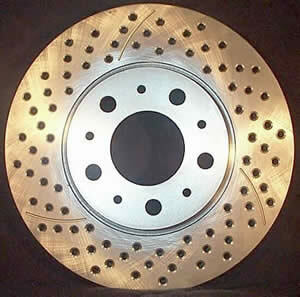 It was a lot of careful design work, measuring, re-measuring, calculating, and then machining everything exactly right. Then it fit together perfecting - and looked stunning. 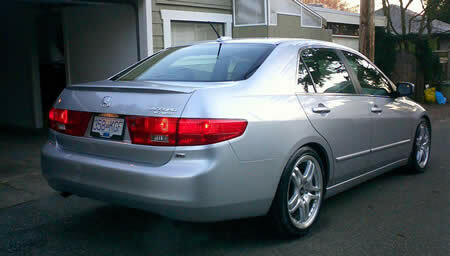 The car looked like an Acura TL, not an Accord. 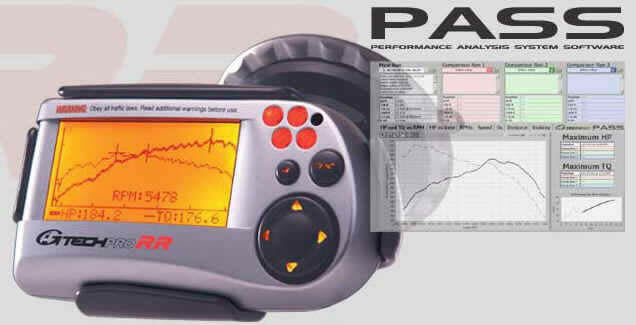 I finally replaced my trusty old G-Analyst with this fancy new Gtech Pro RR unit which not only measures and records acceleration data, but also instantly calculates hp, torque, cornering Gs, and also has additional PC analysis software. I tried it out on this Accord Hybrid and it accurately indicated that the car was producing 255hp. 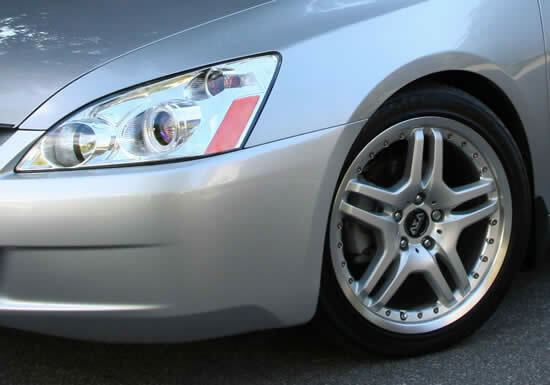 It recorded my corning G forces and again, my Accord, with its race suspension gripped the pavement with more than 0.9g. 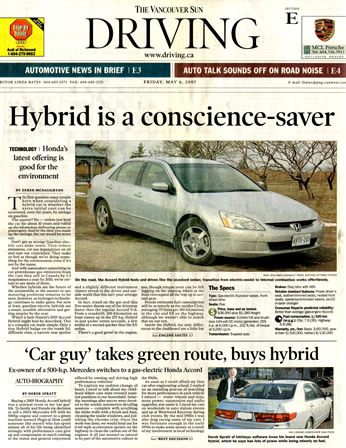 When I sold my 500hp E55 and traded 'up' to a green hybrid, The Vancouver Sun asked me to write a biography on my story - and then they added the review of the Honda Accord Hybrid to round out a full 2 page article.